May « 2007 « R-V There Yet? Well, since we’re in gold country, we had to go and find ours. Tinka did some research and found a guy that takes people out and teaches them to find gold. 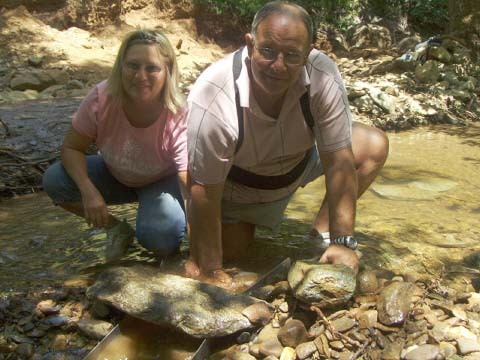 Joshua Vick is a geologist that has been seeking gold for twenty years. He has appeared on The Learning Channel, The Discovery Channel, and The Travel Channel. His business is called Gold Fun Adventures, http://www.goldfun.com/, in Jamestown, CA, about 80 miles southeast of Sacramento. Today he took us and two other couples to a creek bed to do a little digging. His area is just off the road and we only had to walk about 100 feet upstream from the bottom of the path to the creek. 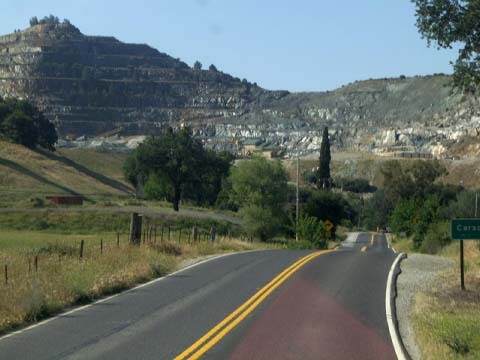 On the way to the “dig” we spotted a gold strip mine that involves removing huge amounts of low-grade rock to process it for gold. 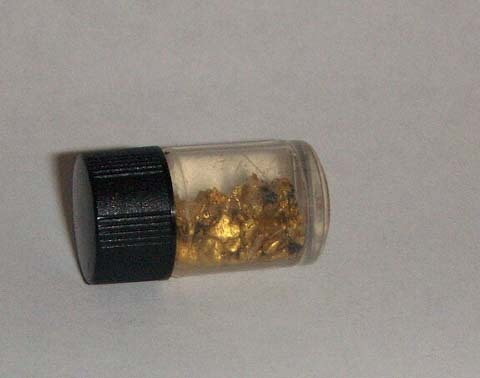 With this type of rock, it takes about 700 tons to produce 1 ounce of gold. That’s a lot of rock. Joshua led us to a point and gave us trowels and picks to start hacking away the dirt and placing it in buckets. We were supposed to dig out all of the dirt down to bedrock, which, thankfully, was only about 6 to 12 inches deep. 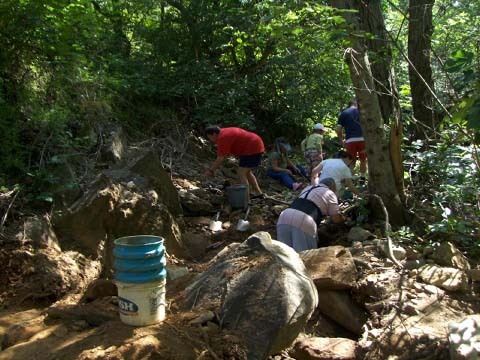 The dirt was quite hard and we were told that the best stuff was right on the bedrock. I selected a spot behind a large tree and just under a heavy rock. Joshua indicated that I had picked out the best spot. Who’d have known? Anyway, the digging went on for about 3 hours and Tinka and I only cleared about a 2′ X 2′ area. The picture below shows me, with the back brace, digging away. Tinka spent most of the time with the sluce box. This back-breaking process involved taking all of the buckets of dirt and washing it through the box to remove dirt and rocks from the dirt that we were digging. 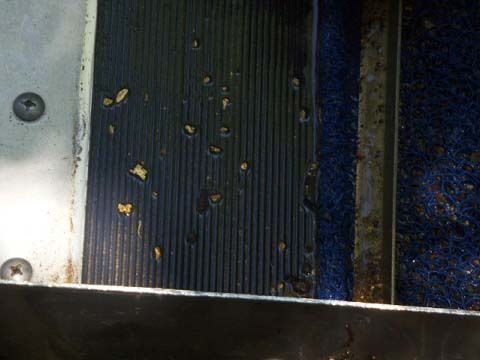 The sluce box washes out dirt in a couple of minutes that would require 15 – 20 minutes to do using the panning method. Below is a photo of Joshua demonstrating the final stages of clearing the dirt from the sluce box. Here we are trying our hand at the sluce box near the end of the day. 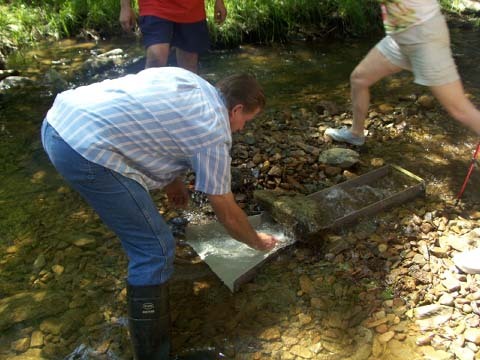 The sluce box is a 4-foot long metal trough that has little dams built into it and a mesh fabric to catch gold dust covering the last 3 feet. A large rock is used to hold the box in position. When we removed the large rock from the sluce box to rinse it out, we were able to see gold chunks at the top part of the box. The residue from the box was dumped into a bucket and Joshua used a pan to obtain the final haul from our day’s work. When the day was done, we split the gold three ways. I’m sure that most of it came from our hole. Below is our share. I wish I could say that the jar was a mason jar, but, alas it was a vial. Well, we didn’t become millionaires, but we had a great time and probably covered the cost of the excursion, less diesel fuel. We went home dirty, wet and exhausted. Tomorrow we are off to find our fourtune in the Gold Rush!!!!!! OOOPPSSS!!!!! We are more than a hundred years too late. BUT, you can still look for gold. So tomorrow we are off to pan for gold!!!! Happy Mother’s Day to all the mothers out there. Hope you all have a wonderful day. 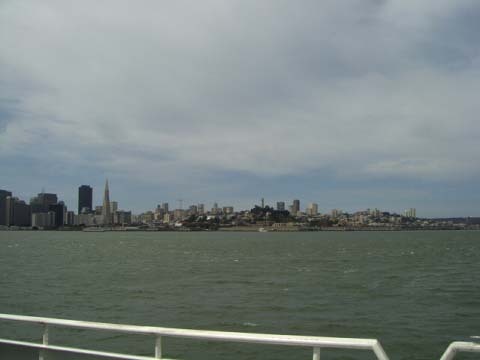 This is the view of San Francisco from across the bay. What would a tour of San Francisco be without visiting Chinatown? We got off the bus and took a stroll through the area to take in the sights and smells. We walked several blocks on fairly level streets. 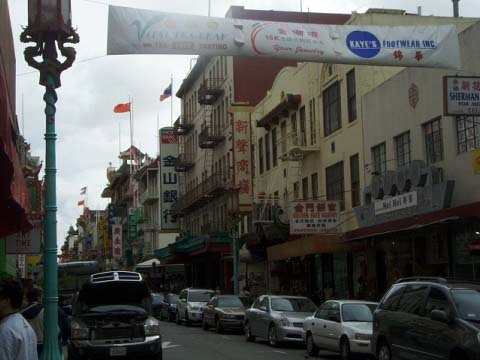 This is a typical street in Chinatown. Then we stopped at Grace Cathedral Church. It is a huge church with beautiful stained glass windows and a gorgeous gold door, which we did not use to enter the church. The interesting fact about the church is that it is for ALL denominations such as Christian, Jewish, Buddhism, and etc. Different type services run all day Sunday and the rest of the week there are about 4 different services a day. The cathedral with the gold door. 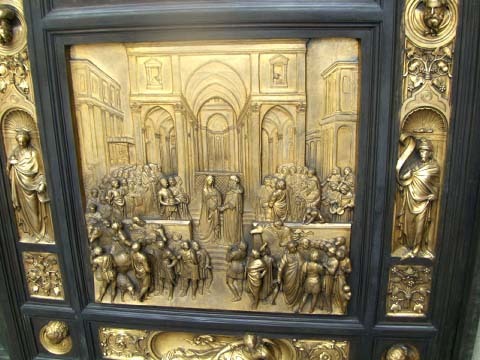 This is a close up view of one of the panels of the ornate, gold door. Of course, you have to see and hear a cable car. 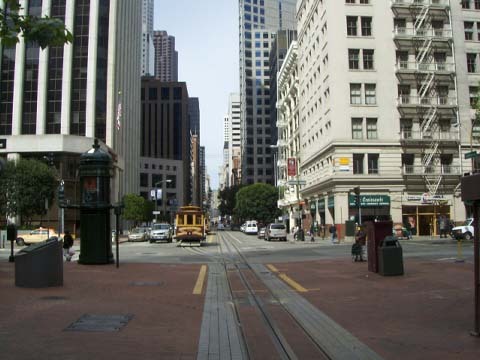 We will go back to SF and ride the cable car. Hope Rick can hang on as the people just hang out the sides. I am sure that is good for his back! I have a few more pictures to upload but while I still see these I will post them NOW!!! I worked on the rest of San Francisco blog for a few hours!!!! It was finished and looked great but you do not see anything!!! Therefore, I am very frustrated and will take a rest from the computer for a couple of days and get something else accomplished. You are currently browsing the R-V There Yet? blog archives for May, 2007.